As a nationwide red diesel distributor, we're relied on by businesses of all types, thanks to our efficient deliveries and friendly service. Are you looking for a nationwide red diesel distributor? One who can offer you competitive prices, a reliable service and long payment terms? Please give us a quick call now on 0845 313 0845 and speak with one of our red diesel distributor experts. Here at Crown Oil, we have been distributing red diesel throughout the UK since 1947. This makes us one of the oldest fuel companies in the country. We will always endeavour to deliver your red diesel when you need it and where you need it – even on the very same day with our emergency red diesel delivery service. 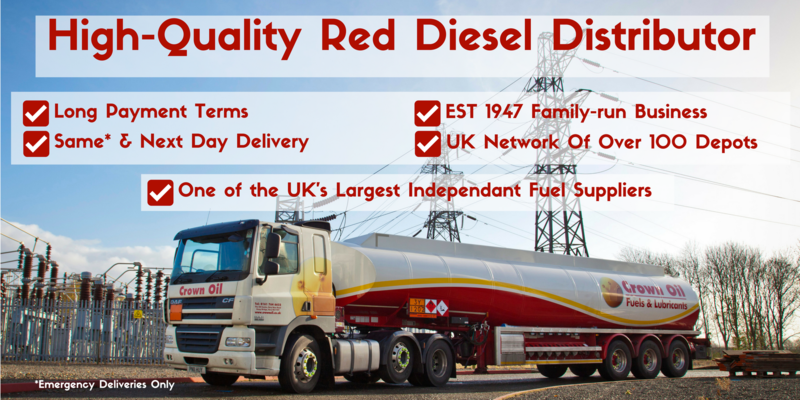 No matter if you’re an SME or an FTSE100 company, we can supply your business with the red diesel you need nationwide. We have a network of over 100 depots throughout the UK meaning you’ll never experience operations downtime when ordering with us. Can I order red diesel now? Absolutely, give us a quick call now on 0845 313 0845 and we will be able to arrange your red diesel order in no time. How long does it take for my red diesel to be delivered? We can deliver your red diesel in a matter of hours if needed, with our emergency fuel service, or with our standard delivery – 96% of our deliveries are made the next working day. Call 0845 313 0845 now to check our red diesel delivery slots.